Geoff is a sports interviewer and reporter. Geoff is a reporter on Sky Sports. He joined the channel in 1992, the first season of The Premiership. He made his reporting debut in 1999 alongside Clare Tomlinson. He can now be seen on the touch-line in key matches notably on Sky Sports UEFA Champions League and Ford Super Sunday live games. Geoff started as a booker on the long-running football discussion show The Footballers Show presented initially by Richard Keys, and Geoff went on to produce the show. The Footballers’ Football Show was widely regarded as the main football discussion show at the time and featured an impressive cast of over 500 guests during its run including the late Bobby Moore, FA Chief Executive Graham Kelly and Arsenal Chairman David Dein. As an on-site producer for all live football coverage Geoff became the Match Director’s eyes and ears on the ground for every game, and this was the role he performed until the end of the 1998-1999 season. In 1999 Geoff made the move to reporter alongside Claire Tomlinson on livePremier League and FA Cup coverage for both Sky Sports and Sky Sports News. The deal signing live coverage of the FA Premier League to Sky Sportsmeant that Geoff’s skills and experience were called upon for a whole new set of support programmes for football as well as live coverage of the games themselves. Geoff can now be seen on the touch-line in key matches notably on Sky Sports UEFA Champions League and Ford Super Sunday live games. In his time he has developed relationships throughout football and is instrumental in inviting many live guests onto Sky Sports live football, coverage such as George Graham, Alan Shearer, Steve Bruce, Graeme Souness and Garry McAllister. In his role as reporter Geoff has travelled far and wide to get interviews including going to LA to interview Arsenal fan Kevin Costner before the 1998 FA Cup Final. 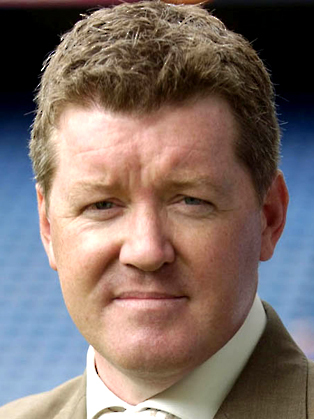 Geoff Shreeves is renowned for his passionate and enthralling motivational speeches. His natural style and exuberant spirit allows him to set an audience at ease whilst keeping entertained and on the edge of their seats throughout the course of the presentation.